Blowout Sale! 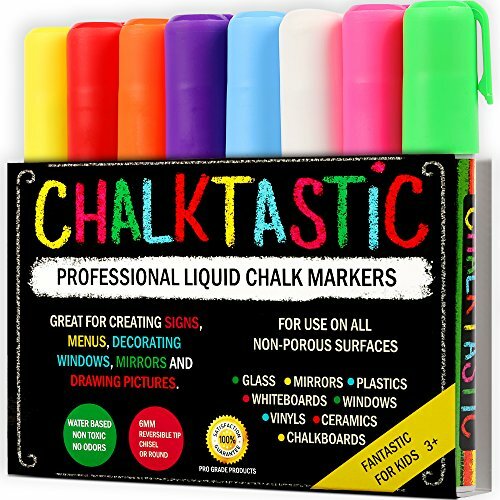 Save 61% on the Chalk Markers by Fantastic ChalkTastic Best for Kids Art Chalkboard Labels | Menu Board Bistro Boards | 8 Glass Window Markers | non-toxic Erasable Liquid Pens Chisel or Fine Tip | Neon Colors plus White by Chalktastic at HoldUp Art. MPN: SC606-1. Hurry! Limited time offer. Offer valid only while supplies last. EIGHT VIBRANT NEON COLORS - ChalkTastic Bright Chalk Marker Pens Pack of 8 use a high-quality, super-concentrated liquid chalk Ink that provides bright, vibrant colors each and every time. Great for Restaurant Menu Boards, Bistro Boards, White board, LED Writing Board, Window & Mirror markers, Car Windows, Kids art, School work, Marking dates on food Containers, Ceramic Mugs, Chalkboard contact paper, Chalkboard Labels, Thank you stickers, Wall Decals and much more. AMAZING VERSATILITY GREAT FOR KIDS - ChalkTastic Neon chalk markers and Fun Pens are NON TOXIC and ODORLESS and will out last ANY other Colored Chalk Pens with their huge capacity. The Glass markers allow you to decorate any ordinary NON-POROUS surface - including chalk labels, mirrors, shop storefront windows, Blackboard, whiteboard, metal and more - into your very own canvas! SUPER EASY CLEAN UP The bright, beautiful liquid chalk Ink in each ChalkTastic Chalk marker is completely dust-free which makes cleanup a breeze for these erasable chalk pens! Simply use a dry or damp cloth to wipe the chalk away without any smearing, streaking, smudging or messes! NOTE: Some Chalkboards are Porous and some Non porous, all Chalk Markers are designed to be used on a Non Porous Surface so Please test on a small area first. ORDER TODAY RISK FREE You can claim your own 8-pack of ChalkTastic Liquid Chalk Markers today at absolutely no risk thanks to our airtight 90-Day Money-Back Guarantee. In the highly unlikely event that you're not completely thrilled with these liquid markers, simply let us know within 90 days for a prompt and courteous refund of your purchase! If you have any questions about this product by Chalktastic, contact us by completing and submitting the form below. If you are looking for a specif part number, please include it with your message.